I love banana muffins. They’re classic. I don’t know who originally came up with using bananas in muffins and loafs but it was one heck of a good idea! The best part is they’re so versatile. You can vary their taste by adding different types of fruit and spices. With this in mind I decided to give my go-to banana muffin recipe a fruity makeover. 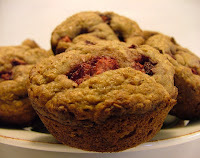 The outcome is these very tasty banana-strawberry muffins! I always feel like a bit of a rebel in the kitchen when I tinker with a perfectly good recipe. It’s like the classic rebel song “Born To Be Wild” by Steppenwolf is playing in my head and encouraging me to turn the tried and true into something new. It’s basically what Steppenwolf did with "Born To Be Wild." It was originally written as a slower ballad. Then the band got wild and turned their boring ballad into the exciting rock song we know today! So the next time you step into the kitchen to make an old favorite, let the rebel cook you have inside take over and see what kind of culinary excitement you can create. Cook-On! Spray a 12-cup muffin pan with cooking spray. Set aside. In a large bowl, combine flour, wheat bran, baking powder, baking soda, cinnamon and salt. Set aside. In a medium bowl, whisk together egg, mashed bananas, brown sugar, yogurt, oil and vanilla extract. Add to dry ingredients and mix just until moistened. Gently fold in ½ cup strawberries. Divide batter evenly among the 12 muffin pan cups. Top each with equal amounts of the remaining strawberries. Bake in a 375º F oven for 18 to 20 minutes or until a toothpick inserted in the center of a muffin comes out clean. Remove muffins from pan and let cool on a wire rack.